that are non-corrosive to brass or bronze and where stem mounting is desired. 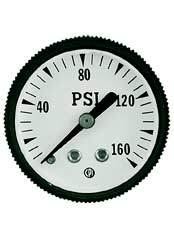 Easy-to-read standard PSI dial with large black numerals on white background. Recommended for use with air, oil and water services. 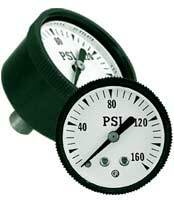 DIAL SIZE: 1½ " and 2"
Standard dials are PSI only. 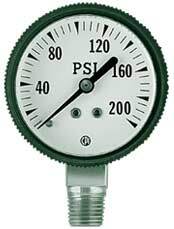 PSI/Kg, PSI/kPa and PSI/Bar also available. Other scales and special configurations can be custom built to your specifications. For more information, contact us at 800/323-5111.